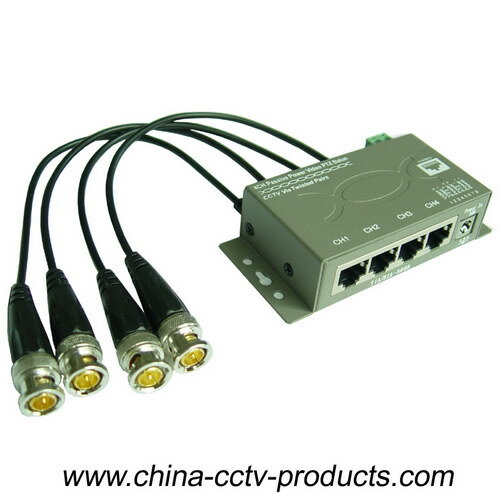 The Power Video Data Combiner Balun is passive transceiver device that combines video, PTZ data, and camera power over a single 4-pair UTP cable to simplify CCTV installations in a structured wiring environment. At the camera end the single channel PVD video balun combiner provides video, power and data on separate outputs. The PVD304H series is designed to be installed at the control room. Each camera power output is equipped with a self-resetting fuse for extra protection. The PVD304 video connections are through BNC connectors and Coax cables to the DVR. 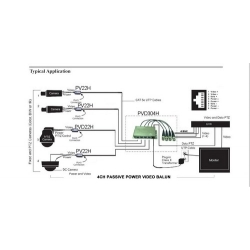 The data connections to the DVR are through RJ45 and Category-5 cables. The PVD system operates well with Cats or better UTP wire,24 AWG(0.5mm) or thicker. Low voltage camera power video may be sent within same wire bundle. Do not use shielded twisted-pair wire. Do not use un-twisted wire. All RJ45 Connector follows industry-standard TIA/EIA 568B pinouts.